Sadly, these days B.Traven and his many novels have been assigned to relative obscurity in the world of literature and politics. Traven was but one of the many aliases used by this mysterious author, adventurer and revolutionary. Many historians have tried to uncover the secret behind Traven’s identity, linking him from the illegitimate son of Kaiser Wilhelm II to a theology student from Cincinnati. Whatever the case, Traven always shied away from the spectacular role as author as superstar, preferring to let his novels be judged by the ideas contained within. The Death Ship is the story of a horrendous chain of events that befall an American sailor appropriately named Gerard Gales. Gales loses his identity, humanity and right to existence when his ship sails without him with his sailor’s card and passport still on board in his jacket pocket. Stranded on foreign shores, our sailor is systematically persecuted by the authorities of various European countries he has no desire to even be in. Gales is frequently jailed, deported and even sentenced to death simply for the crime of being a worker without papers. Needless to say he is treated with respect only by fellow workers who share what little they have with him. Bereft of a sailor’s card, Gales cannot secure a job on a ship to go home to New Orleans. To further complicate matters, the American consulate won’t supply him with the necessary papers because he has no proof of his identity. Gales travails with bureaucracy assume truly Kafkaesque proportions in his attempts to prove his American citizenship; while wealthy fellow travelers obtain the necessary documents within minutes provided by obsequious officials who make ordinary folk wait around like cattle. Desperate to escape his precarious situation, Gales reluctantly accepts a job on the Yorikke , a rusting hulk rumored to have been built in the times of the ancients. Gales fellow crewmates are all in the same unfortunate position, unable to secure passage on a decent ship with Union conditions. The Yorikke is truly a death ship. The work regime is torturous and simply unsustainable with sailors jumping overboard or murdered by the captain, unable to keep pace with the hellish amount of work. Not much can be said for the health and safety conditions either with sailors frequently burning themselves in the antiquated steam room, and even the ships rats won’t touch the swill doled out to the hapless and perennially hungry sailors. Some critics have dismissed The Death Ship and Traven’s body of work as being hopelessly dated and idealistic because Traven makes explicit attacks on the dehumanizing aspects of capitalism and unfettered greed. Indeed, the last few decades have seen popular literature retreat either into general misanthropy or even worse, the glossolalia of post modernism. These days novels that articulate the premise that any positive change from below is possible are as rare as hen’s teeth. Indeed we are expected to consume defeatist literature which not only depicts the working class as boorish, uncultured thugs, schooled in misogyny and mired in xenophobia and self-hatred, and yet we are given no plausible reasons for such outlandish stereotypes. Traven was cut from much different cloth compared to the current crop of defeatists and out right reactionaries masquerading as serious authors so popular today. While Gales and his fellow sailors often faced insurmountable odds put in their way by the real axis of evil, the bosses, cops and the state, they always fight back using solidarity and mutual aid as the only weapons they have. 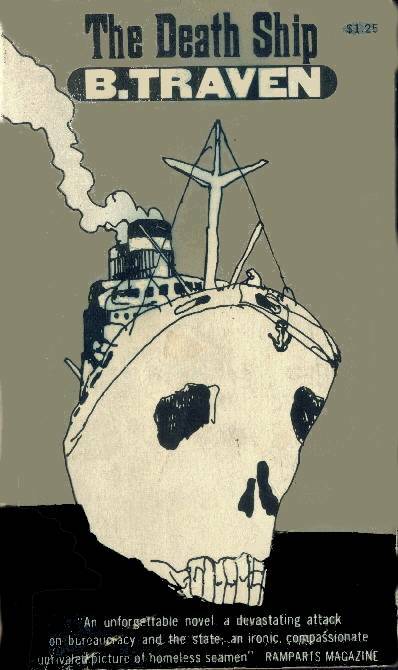 While The Death Ship is a truly terrifying book to read, it is also full of black humor, the inventiveness of which is truly astonishing. There are also numerous references to the Industrial Workers of the World and the Russian Revolution which remind the reader of a time not so long ago when the ruling class was in collective retreat and world wide revolution seemed just around the corner. In the current political climate, The Death Ship serves to remind the reader of the plight of seafarers, particularly those from Majority world (Third world) countries who sail on modern day death ships which are registered under flags of convenience so the owners can circumvent environmental, health and safety, and pay conditions hard fought for by previous generations of sailors. At the moment in Australia, ships that operate in Australian waters are being reflagged, the crews sacked and then replaced by Ukrainian sailors on only $20,000 a year. Needless to say, the Ukrainian crews will be forced to work much harder for much less than their now unemployed Australian class brothers and sisters as transnational capital seeks to push wages and conditions down in the global race to the bottom. Hopefully sailors, who have traditionally been the most revolutionary sector of the working class, will not fall for the fratricidal myth that their jobs are being stolen by cheaper Third world labor. This blame the victim mentality only serves to disguise the role that governments in conjunction with shipping companies have played in decimating the working conditions of sailors. Likewise, comparisons can be drawn between The Death Ship and the current plight of workers wishing free movement across borders worldwide. Not much has changed since Gales was locked up for being an illegal alien in the 1920’s to Australia in 2002 where workers are put in camps in the desert simply for the crime of arriving without the necessary documentation. In fact authorities would prefer that undocumented workers died in their quest to reach the workers paradises of America, Australia and Europe. Who mourns the 2000 Latin Americans who have died in the last 10 years trying to cross the militarized border between Mexico and the U.S.A, or the 351 Afghans and Iraqis who drowned trying to reach Australia in an area under constant military surveillance? Not to forget the Moroccans washed up on Spanish beaches, Chinese suffocated in shipping containers en route to Britain or Gypsies murdered by racists everywhere? Review is by PM, a hospital worker from Melbourne, Australia. Taken from the Antagonism website.